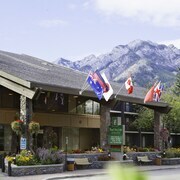 Overall the room was good enough, staff friendly, close enough to downtown and reasonably priced for Banff. Nice, quiet and close to the TransCanada Highway, a very convenient location and with some of the nicest views of any hotel near Banff. 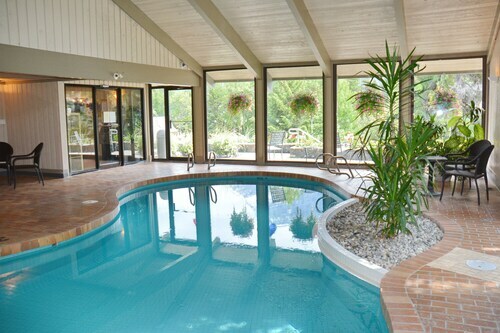 Walking distance to all of the shops in Banff, nice big pool, wifi included, complimentary under-ground parking which was a nice bonus. 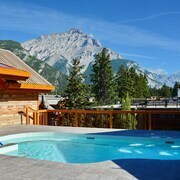 I would definitely recommend this place as an economical place to stay while vacationing in Banff! 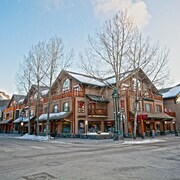 Still a great and welcoming stay, a nice place if you want to stay in Banff without feeling cramped directly in town. Located on the edge of Banff, you are out of the crush of tourists, but close enough to access the amenities of the town. It was great we could use the other resorts. 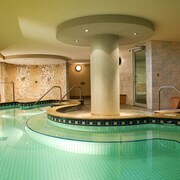 Unfortunately the hot pools at The Fox was not in service. But we were able to use the ones at the other resorts. Where to find Banff hotels near an airport? Where can I find hotels in Banff that are near tourist attractions? Visitors to Banff National Park can find a variety of accommodation choices in Banff. The Expedia database contains 37 hotels within 0.1 kilometres (0.1 miles) of the center of Banff. 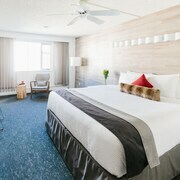 One of the ingredients to stress-free traveling is booking a room that's close to the action, so be sure to check out the latest offers at The Fox Hotel and Suites and Delta Hotels by Marriott Banff Royal Canadian Lodge, which are located within 1 kilometre (0.6 miles) of downtown Banff. The Banff Gondola is among the most popular attractions in Banff. Many tourists choose to stay near this iconic landmark when they are in Banff. 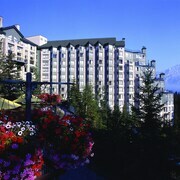 The Fairmont Banff Springs and Hidden Ridge Resort are close by. Cave and Basin National Historic Site and Mount Norquay Ski Resort are popular Banff, attractions, and many visitors choose to stay close by. The Banff Aspen Lodge and the Banff Ptarmigan Inn are closest to Cave and Basin National Historic Site, and the Brewster's Mountain Lodge and The Juniper Hotel are close to Mount Norquay Ski Resort. Central Park and the Banff Centre each have accommodations nearby. 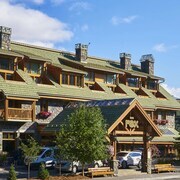 The Rimrock Resort Hotel and Douglas Fir Resort and Chalets are close to Central Park, while the Buffalo Mountain Lodge and Charltons Banff are close to the Banff Centre. If you choose to book accommodation near the Banff Park Museum, choose from accommodation options which include the Banff Caribou Lodge and Spa and Banff Inn. 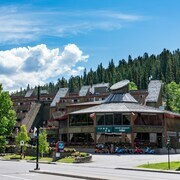 Finally, if you are interested in staying near the Walter Phillips Gallery, your nearby accommodation options are the High Country Inn and Banff Park Lodge. The Rundle Cliffs Lodge can be found 18 kilometres (11 miles) away from the main part of Banff. Another accommodation option is the Sunshine Mountain Lodge, which can be found 15 kilometres (9 miles) away. Two other options around Banff include the Solara Resort and Spa and the Paradise Resort Club. The larger Canadian Rockies area is well worth exploring too. Spend time at Canadian Rockies' nature museums and also photograph the region's forests and rivers. Travelers in this part of Canada can enjoy snowboarding. The nearest accommodation options in Banff National Park are Harvie Heights and Canmore. Harvie Heights is 15 kilometres (9 miles) to the southeast of Banff, while Canmore is 17 kilometres (11 miles) to the southeast. 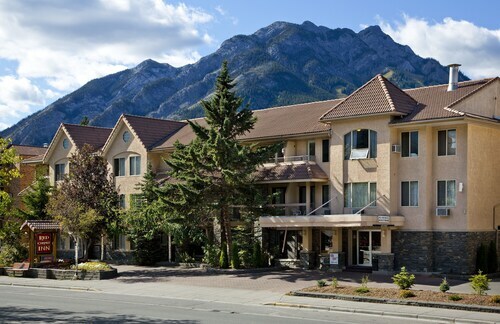 Hotels and apartments in Harvie Heights include the Sunset Resorts Canmore and Grande Rockies Resort. 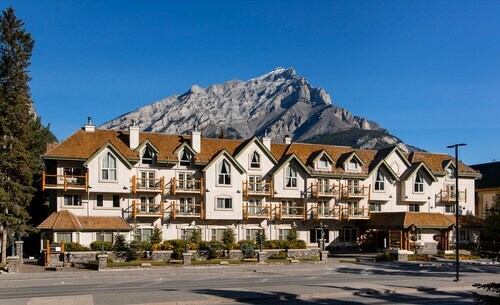 The Stoneridge Mountain Resort and Canmore Crossing are the accommodation options in Canmore. Calgary International Airport is a logical airport for arriving in Banff. It is 110 kilometres (68 miles) away. If you plan to stay nearby, try the Delta Hotels by Marriott Calgary Airport In-Terminal or Best Western Premier Freeport Inn & Suites. What are the most popular Banff hotels? Are there hotels in other cities near Banff? 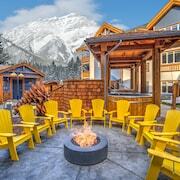 What other types of accommodations are available in Banff? Explore Banff with Expedia.ca’s Travel Guides to find the best flights, cars, holiday packages and more!